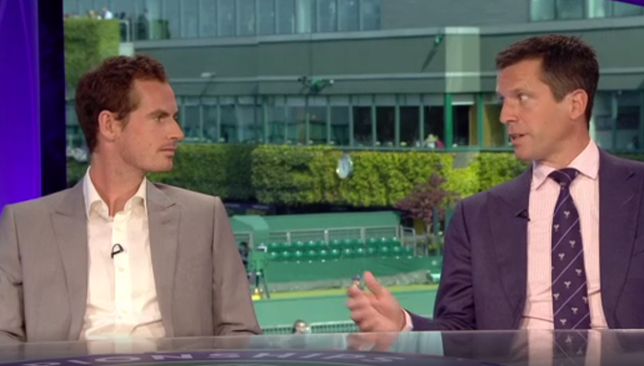 Andy Murray‘s stint as a pundit for the BBC has got off to a good start as the Scot was voted less boring than Tim Henman in a poll that was suggest by the pair themselves. Murray, who pulled out of Wimbledon before the tournament started as he continues to regain his full fitness from a hip surgery he underwent early this year, was in the BBC studio at Wimbledon on Tuesday, joined by Henman and Sue Barker, and will be commentating on the men’s quarter-final matches on Wednesday. Barker promised the poll would go on the BBC website and the results are in. 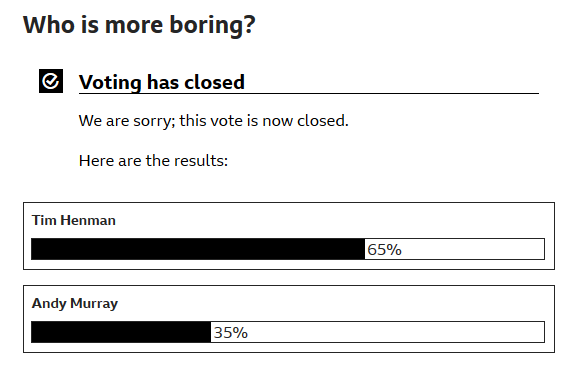 They’re not as tight as they thought it would be with Henman voted more boring than Murray by 65 per cent of the people who took part in the poll. Murray on Henman getting voted more boring than he is by 65% of voters in BBC online poll: “I was expecting a bigger margin to be honest. Did you message all your family to go and vote? Murray, a self-professed tennis nerd, is exactly the stats geek we thought he was. From nailing Serena Williams’ Grand Slam semi-final appearance count, to the number of tiebreaks and sets Milos Raonic and John Isner have played against each other. His analysis on Tuesday ranged from breaking down Angelique Kerber’s mental struggles last season, to saying Novak Djokovic can beat everyone left in the tournament. It’s only a couple of days of work but it’s fair to say that Murray has already outperformed many pundits who have been doing this for years. Nadal’s second serve is underrated. Says Nadal is actually number one in history in points won on his second serve. 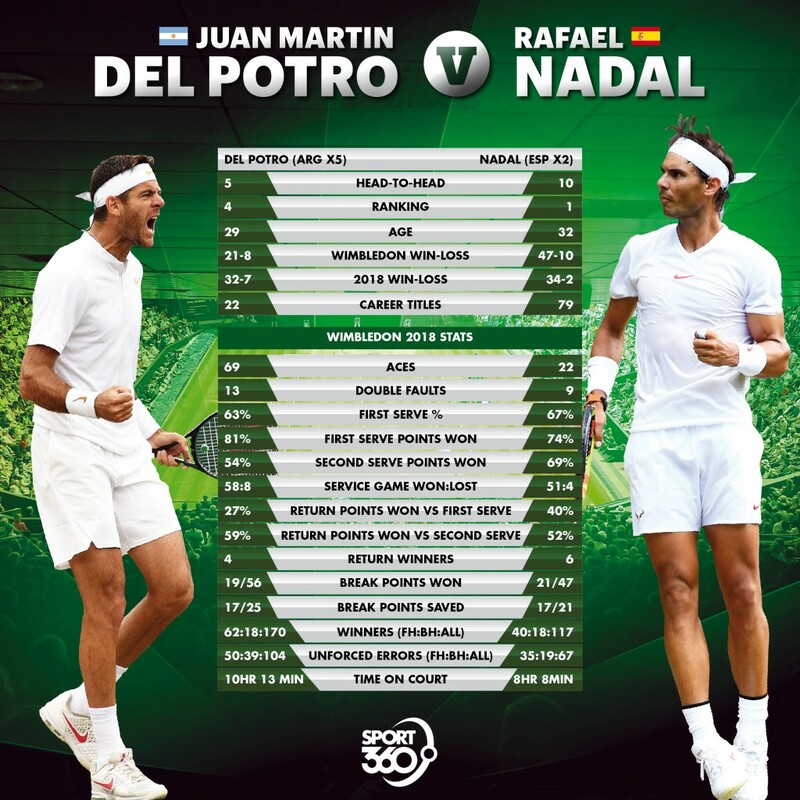 6 of the guys in the quarters (including Nadal), are in the top-11 of all-time in second-serve points won on grass. Meanwhile, Serena Williams has been asked in nearly every press conference this fortnight when her friend, Meghan Markle, the Duchess of Sussex, would be coming to watch any of her matches at Wimbledon. Williams, who attended the royal wedding, joined Markle at a polo match before the tournament and has been saying she needs to keep winning matches in order for her friend to come down to SW19. Now that the American is in the semi-finals, will Markle make an appearance in the Royal Box? “I don’t know. Just stay tuned, right?” said Williams with a smile. That’s a show I would binge-watch on Netflix. 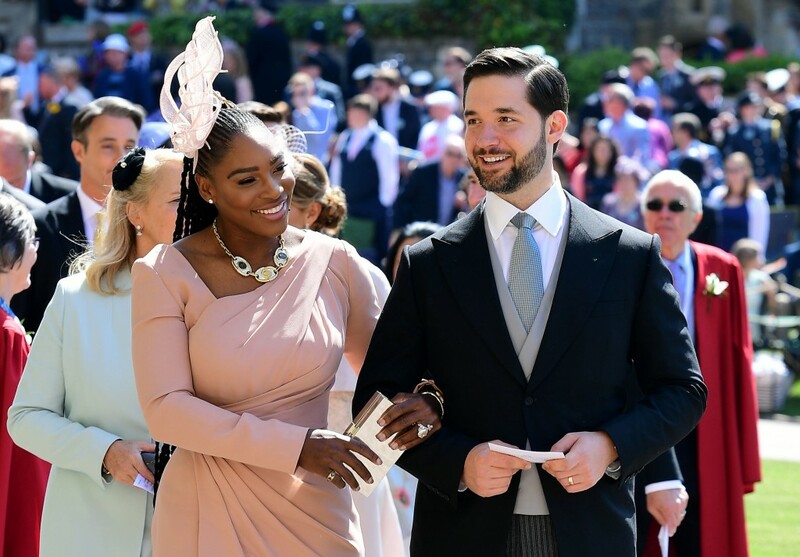 Serena at the royal wedding. The women’s quarter-finals delivered four nail-biting encounters at Wimbledon on Tuesday, with Serena Williams coming back from a set down to defeat Camila Giorgi 3-6, 6-3, 6-4 and set up a semi-final against Germany’s Julia Goerges. “This is only my fourth tournament back, so I don’t feel pressure. I don’t feel I have to win this, I don’t feel I have to lose this. I’m just here to prove that I’m back. I still have a long way to go to be where I was,” said Williams. Goerges also had a fightback of her own as she overcame her good friend, Dutchwoman Kiki Bertens, 3-6, 7-5, 6-1 to reach her maiden Grand Slam semi-final at the age of 29. “It’s never easy playing a friend, especially when you know each other so well. I don’t know what to say right now. I’m just very happy with my performance today and I’m looking forward to the next one,” said the 13th-seeded Goerges. The German lost to Williams in the third round at the French Open last month and will be searching for a better outcome this time around. Latvian Jelena Ostapenko found the fire that earned her the French Open crown last year and battled back from a break down in the opening set to skip past Dominika Cibulkova 7-5, 6-4. “It was a very tough match but I was just trying to enjoy it because it’s really great to be here in the second week and in the quarter-finals, now I’m in semis. I’m really happy the way I played, I was down in the first set but I was fighting till the end and I think I finished kind of confident,” said the 21-year-old. Her reward is a semi-final showdown against 2016 runner-up Angelique Kerber, who needed seven match points, and a 10-minute final game to defeat crafty Russian Daria Kasatkina 6-3, 7-5. 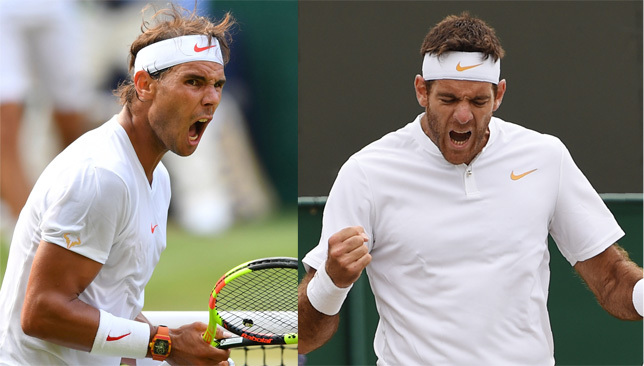 Watch highlights above from a memorable day eight at Wimbledon.